In the plumbing and HVAC industry, there is such a thing as a particle counter which is used in detecting the physical count of particles. Presently, aside from counting or measuring these particles, there are also several systems that help monitor contamination and microbes. Depending on the size of the particle, it could be very difficult to get rid of those that cannot be seen by the naked eye. At Airtech Vacuum Incorporated, vacuum systems for particle measurement can be used. There are many ways by which particles can be measured in a given space. There is the optical counting technique where a light source is used in order to illuminate the particle. From there, it will be easy to sum up the amount of particles present in the space. Light blocking, also known as obscuration, can also be used in particle counting. This is recommended when detecting the presence of particles as well as the sizing of particles that are more than 1 micrometer in size. The light scattering method, direct imaging, and the Coulter principle may also be used. Want to know the role of vacuum pumps in the particle measurement industry? These technologies can actually help determine the sizing of particles when conducting indoor air quality research, industrial hygiene studies, or even when testing the degree of efficiency expected from the use of face masks and protective clothing. Among several applications for the vacuum technology are workplace monitoring, evaluation of a person’s exposure to landfills, mines and hazardous wastes, and when characterizing source particles. Why Choose Airtech Vacuum Incorporated For Particle Measurement? 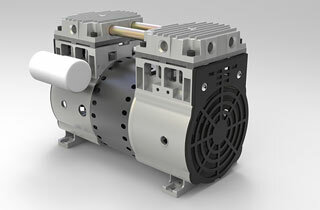 Since our company has been established in 1982, Airtech Vacuum Incorporated has already led the market for manufacturing different types of vacuum and blower technologies like dry piston vacuum pumps, dry rotary vane pumps, variable speed blowers, and more. We have with us a team of men who tirelessly work in order to serve each industry with unparalleled technology. Our dry piston vacuum pumps and variable speed blowers for particle measurement can be easily installed and operated thereafter with notable features to love. Our company and products have obtained certification from CSA, CE, RoHS, UL and ISO9001-2008. We begin our work by sending our knowledgeable engineers onsite to analyze your situation before recommending the vacuum technologies appropriate for your industry and application. We have with us predesigned products that can work for your industry or you can choose to have your products customized by our team. Airtech prides itself of the quality performance of every product and offers options at the most competitive prices available in the market. Enjoy browsing through our inventory today and source for top-notch particle measurement vacuum and pressure products with exceptional ease! We guarantee that you will experience the best in terms of shopping these technologies from us!